A 20 Year Career Spent Attacking Your Gun Rights! Moments ago, New Jersey Governor Chris Christie threw his hat into the ring as a Republican contender for the Republican nomination to be president of the United States. Of course, these days it seems like everyone wants to be President, as we now have approximately 20 declared or undeclared candidates seeking your support in the upcoming Iowa Caucuses. As Iowa’s largest and only No-Compromise gun rights organization, Iowa Gun Owners will be issuing candidate surveys to all of these candidates in the near future, giving you a chance to hear from them first-hand on whether or not they support your gun rights. While we have not yet issued these candidate surveys, we have plenty of hard facts to report to you right now on Chris Christie’s record on the 2nd Amendment! 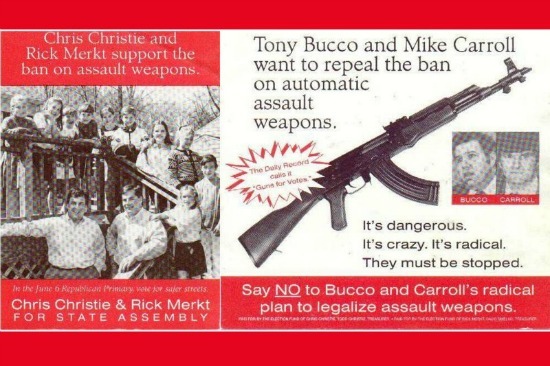 Simply put: Chris Christie has made a career out of attacking your gun rights. That’s what Governor Christie thinks of gun owners, not only in New Jersey, but also right here in Iowa! Of course, as Governor of New Jersey, Christie already presides over one of the most radically anti-gun states in the entire country. And as Governor, Chris Christie has refused to lift a finger to overturn the ban on gun shows, the ban on modern firearms, the law that precludes gun owners from buying more than one gun per month, and a host of other 2nd Amendment issues. But Chris Christie’s hatred for your gun rights didn’t just stop at his refusal to work to change anti-gun laws already on the books. >>> Requiring gun dealers to make their records “open to inspection” for any reason to the state police – already notorious for their harassment of gun owners. I could go on and on, as Christie’s attacks on gun owners in New Jersey are legendary! But now it’s up to you and me to make sure that Governor Christie knows that he’s not getting away with this scot free. That’s why I hope you’ll sign the petition to Chris Christie today, demanding that he apologize for his decades-long attack on your right to keep and bear arms! Of course, like many candidates circling Iowa right now, Governor Christie would have you believe that he supports your gun rights. Candidates vying for the attention and support of gun owners during the critical six month lead-up to the Iowa caucuses will say and do almost anything to get your support. For some candidates, it is hard to find out where they stand if they do not have a legislative record to run on or haven’t been in office in a long time. In this case, the facts are clear! Chris Christie despises gun owners and the Second Amendment. So make sure Chris Christie knows what you think about his bitter opposition to your gun rights, by signing the petition below! Governor Christie will shortly be coming out to Iowa to try to bamboozle and fool gun owners into thinking that he will be a pro-gun president if elected. Iowa Gun Owners will be very busy over the next couple of months shining the light of truth on Chris Christie’s record – a record he’s desperate to keep under wraps. We’ll be doing this by direct mail, using our powerful social media platform, statewide email deploys like the one you’re reading right now, and hard hitting radio ads if possible. But we’re going to need help to pull this off. So in addition to signing your petition below, please consider a generous donation of $100, $50, or even just $25 to help Iowa Gun Owners expose Chris Christie’s horrendous opposition to our gun rights! Just 2 years ago in Washington D.C., you and I watched as Republican leaders, who professed to be strong supporters of your gun rights, scattered like flies as President Obama and his allies in the Senate mounted one of the largest attacks on our gun rights in a generation. Even right here in Iowa, you and I have learned over the past 7 years that party affiliation is by no means a guarantee of someone’s loyalty to the Second Amendment. That’s why it’s so important that Iowa Gun Owners has the resources necessary to educate tens of thousands of gun owners across the state about the REAL Chris Christie – as he courts their support. So please, sign your petition to Chris Christie right now. Please also consider your generous and immediate contribution of $100, $50, or even just $25 right now, to help us maintain the pressure across the state as Governor Christie ramps up his campaign. Governor Chris Christie and his elitist friends out East are counting on their ability to bamboozle you and me. They arrogantly assume that we’re all out here in fly-over country and we’ll accept anything they say as the truth. And it’s up to you and me to make sure it doesn’t work here in Iowa! Please sign your petition and make sure to give us the resources we need to expose Chris Christie’s hatred of your gun rights! P.S. Just moments ago, New Jersey Governor Chris Christie announced his candidacy for the GOP nomination to be President of the United States. Governor Christie will undoubtedly be coming out to Iowa in the future as he turns to Iowans to help him kick off his Presidential campaign. Gun owners in Iowa will play a pivotal role in determining who emerges out of Iowa as a viable contender. That’s why it’s so important that gun owners know that Chris Christie has waged a decades-long attack on the Second Amendment during his time in office in New Jersey. Please sign your petition to Governor Christie today, demanding that he apologize for his years-long attack on the 2nd Amendment! And if you can, please consider an immediate generous contribution of $100, $50, or $25 to enable IGO to get the word out to tens of thousands of gun owners across the state who may not know about Governor Christie’s hatred of the 2nd Amendment!